Take a goalie that has already won a boys hockey state championship. Add a team in front of him committed to defense. 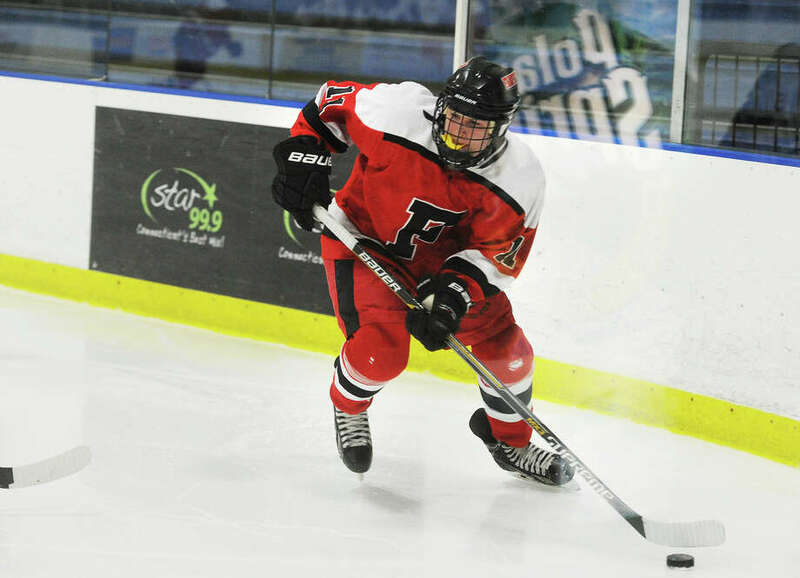 Fairfield tweaked its forecheck a bit and wasn't thrilled with the result, but its defensive-zone work was fine in a 4-1 win over Milford to start the Division II tournament at the Wonderland of Ice. "They made my job easier," said senior goalie Kyle Greenhut, who was in net when the Mustangs won the 2013 Division II title in overtime. Greenhut came through with clutch saves after Andrew Gobany cut Fairfield's lead to 2-1 early in the third period. Jake Fuss finished off a hat trick with 3:55 left to make it 3-1, and Trevor DeMilt scored on a late power play to end it. "We were playing two and a half, three lines," Fairfield coach Tom Roche said. "It paid off." Sixth-seeded Fairfield (15-7) will face third-seeded Branford (17-5-1), a 4-0 winner over defending champion Hand, in Friday's quarterfinals at a site and time to be announced. The teams split in the regular season, a 6-2 Hornets win to open the season and a 2-1 Fairfield overtime victory on Feb. 18. Milford (10-10-1) came on strong in the third period, and Andrew Gobany scored on a rebound 2:40 into the third; Greenhut had made a nice blocker save on Jonathan DePascale's initial shot. But Gobany couldn't solve Greenhut a second time on a three-on-two with 6:44 left. Greenhut made two saves off the faceoff. All game, the Mustangs got sticks on sticks, filled shooting and passing lanes and kept Milford from getting many clean shots. "About halfway through the season we started stepping it up," Greenhut said. "D-zone got much better. I think that's where it starts for our team, D-zone." DeMilt broke up an early Milford two-on-one, and Fuss scored on a spinning backhand at the front of the Milford net soon after, 2:03 into the game. Milford's Sean Rowland stopped DeMilt, P.J. O'Reilly and Fuss in succession midway through the second, but Fuss managed to get the last rebound across the line for a 2-0 lead. Fairfield opened the game in a different forecheck, Roche said. "We had a game plan. It didn't quite work the way we expected," Roche said. They went back to a little less aggressive system that helped them settle down. "We struggled at the beginning," Roche said. "Milford's a tough team. We beat them 1-0 (in the regular season). We knew it'd go to the end."